Join us for the FHI Story+ Summer 2018 Research Symposium! Our ten Story+ teams have spent six weeks unboxing curious artifacts (a giant puppet named 'Big Papa' among them! ), uncovering telling facts of social history at Duke and beyond (the FBI was once monitoring Duke student protesters! ), remixing content into educational videos and graphic memoirs, and interviewing former coal miners in Appalachia. 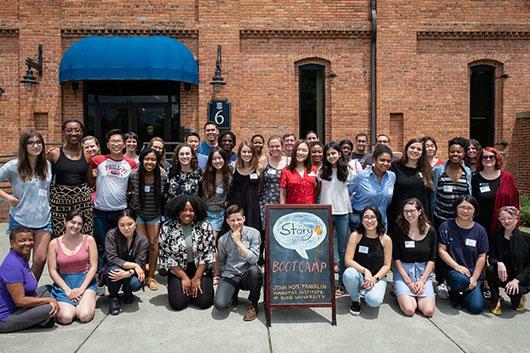 Story+ students explore humanities research approaches (archival research, oral histories, narrative analysis, visual analysis, and more) with an emphasis on storytelling for different public audiences. At the Story+ Symposium, each team will present final projects and/or works-in-progress. A celebratory Dessert Reception will follow.